For the lack of a more inspired and creative title, I have called this article "Horses in France". The title may not be inspired, but if you're into horses the article will be worth your while reading. It answers many of the main questions when you are considering moving to France with horses. You may well wonder why there is even a need for such an article, given that people who have kept horses in the UK should be well versed in all the requirements of horse keeping, but if you are moving to France and bringing horses with you, there are certainly some key differences which are best understood in advance. Please note too, that you are now required by law to have your horse micro chipped in France. At one point, this was only necessary for competition horses, but it is now a legal requirement for all horses. The chipping is easily arranged through any local vet. As a horse owner in the UK you will have built up a trusted network of suppliers and advisers, and suddenly you are on your own. You will need to establish a new relationship with a vet, find a good farrier, source feeds and other horse related equipment and face the thorny issues of insurance requirements. And you will no doubt discover all manner of other problems along the way. That is the nature of horse keeping. There are always problems, it's just that the problems you will face in France can be different from those of the UK! In the warmer parts of France you will probably find that the grass quality is poor, with the land turning easily to mud in wet conditions and drying to a rock hard baked brown in summer. Here in the Aude department (Aude Property Guide) and in the neighbouring Ariège (Ariège Property Guide), we find that we have to feed hay for most of the summer, and feed less in the winter when the grass is better. This is, of course, the opposite of the situation in the UK. If you are building stables or deciding what buildings to use for your horses, give thought to the long hot summers which much of France enjoys, and try to claim as much shade and shelter from the sun and the flies as possible. Those of you who will be needing to find livery stables, there seem to be plenty around, even down here which is not generally considered a horsey part of the country. Most are clearly marked on roadside boards, and you will also find them in the "Pages Jaune", France's Yellow Pages directory. There are a few key differences between livery practices in France and in England. Livery stables in France tend to keep horses separated in individual (and frequently very small) paddocks, separated by electric tape fencing, whereas in the UK horses are usually turned out altogether in large paddocks. This does avoid the frequent bite and kick injuries which are part and parcel of livery life in Britain, and seems to work well. French loose boxes are also somewhat smaller than English ones. We have knocked two into one to create the space that our horses are used to, but of course you are not able to do this in a livery yard. Of course, all yards vary, so try to see as many as possible before making your choice. Once you have found somewhere for your horses to live, the next requirement will probably be finding a source for buying feeds, hay and equipment. Once again, much depends on where you are moving to, as the recognised "horsey" parts of the country, such as Normandy (Upper-Normandy Property Guide, Lower-Normandy Property Guide) will have different feedstuffs and suppliers from those down here in the south. It seems that the nearer you are to Britain, the more likely you are to be able to access similar products for your horse from those available in the UK. However, broadly speaking, it is hard to find chaffs and alfalfa feeds in France, and even the mixes tend to be pellets rather than cereal mixes, and frequently of a slightly higher protein content than we are used to back in Blighty. Straights are also commonly fed without the addition of bulk which seems unwise to the British mind. At first I worried about this and kept begging anyone who was driving to and from our area of France to bring back sacks of chaff for my horses, but I have long since given this up and the horses are doing just fine on the pellets and hay available here. I buy hay from a local farmer, and it is cheaper and of better quality than that which I bought in England. All of these deliver to France at very reasonable rates even if they are not based here. Remember when ordering that measurements are different here too. Instead of the British measurement of hands and inches, the French use centimetres. To get an accurate measurement you will need to use a tape or rule, but as a rough guide a 15.2hh horse equates to 155 cm, and a 16.2 to 165cm, and so on. At the risk of repeating myself, once again it really depends on where you live, but flies can be even more of a pain for your horses in France than they are in England, which is an unfortunate trade off for the warmer weather. Ticks are a problem as they carry the sometimes fatal disease of piroplasmosis. Symptoms include lethargy, depression, joint stiffness and loss of appetite, although frequently these symptoms can be confused and attributed to other problems. The only answer is to vaccinate against the disease (vaccines are now widely available although not considered absolutely failsafe), and to protect with a spot on or spray on preparation as recommended by your vet. If you see a tick on your animal, you can remove it, but it is still advisable to take the animal to the vet for a check up and blood test, especially if there are any signs of the animal being "not quite right". Another problem that can occur through insect bites, particularly in the south of France, is leishmaniosis. This is another potentially serious or fatal illness, caused by the bite of the sandfly. It is treatable, if caught early enough, by the simple method of giving daily tablets of Allopurinol. A blood test is the only reliable form of diagnosis. Among the other horrors are the flat flies or "mouche plat" which are less common in most parts of the UK than they are in France. These are particularly unpleasant characters who like to crawl around under a horse's tail, which can make sensitive horses very unhappy. There are various methods of dealing with these, ranging from the simple (a coating of Vaseline to make it too slippery for the blighters to hang on) to the bizarre (Avon moisturising cream!) to the expensive but effective ("Versatrine" from the vet). Others swear by feeding garlic and cider vinegar... I think really it is a question of trial and error to see what works for your horses and in your area. The bot fly is another character who can cause problems... you may have met this in the UK, but in my experience the horses reacted more violently against it here than they did back in England. Fortunately it only appears for a couple of hours a day in August and September where I live in the Aude, so I simply bring my horses in for that period. Though in other parts of France this may differ. I understand that in central France it appears at any time from late June from the moment the air warms up. A point of interest here is that native French horses seem to be far less affected by these flies than the ex-pat horses. Vets in France are as highly qualified and seem to be every bit as professional and caring as they are in the UK. Of course there are good ones and less good ones, and personal recommendation is usually the best way to find the vet for you. They will come out on call to treat a horse at home, there are specialist horse vets in the practice who deal with horses, and you can purchase most products for your horses' healthcare at the surgery counter or in any local pharmacy. The large cities have specialist veterinary hospitals where serious cases can be treated. Equine dentists and back specialists seem to be less common, with tooth and back care being carried out by the vet rather than a specialist. In my experience, the care is of a high standard and there seems to be less likelihood of unnecessary treatments being administered. Farriers are plentiful, in my area at least, and every bit as unreliable as those we knew and loved back in the UK! Finding a good one is best done through recommendation, so if you don't know anyone with horses in your area it may be worth asking your vet to recommend one for you. For all horse owners there may come a sad day when we have to consider our horses well being before our own emotions, and we may have to take the difficult decision to have the horse put to sleep rather than cause further suffering. In France this is usually done by lethal injection, often with two injections administered to first knock the horse down then to stop the heart. It is, of course, deeply distressing for the owners, but fast and humane for the horse. It is illegal to bury a horse, even on your own land, and the accepted procedure after death is to have the body taken away for cremation by a recognised organisation (the vet will advise). Horses too, must have their passports clearly marked as "not for meat". The surprise is that the riding schools here don't take advantage of this, seeming to be obsessed with dressage and show jumping to the point where at many establishments there is no such thing as hacking out. Having said that, however, teaching is of a very high standard, and all the horses I have seen are well cared for and kept in immaculate surroundings. Riders here are encouraged to progress through the exam system known as the "Galops", ensuring a thorough equestrian education! Insurance, in case of an accident caused by your horses, is usually done through your household insurance policy. Check with the insurers to make sure that this is the case, and be very clear on what exactly is covered, as this can be a notoriously grey area. If you intend to hack out in the winter, between the months of September and March, be very vigilant as these are the hunting months when "Les Chasseures" are out and about. The French are very keen amateur hunters, and it can be startling (to say the least!) for a horse to hear the sudden bursts of gunfire, or to be taken unaware by a pack of dogs in full flight on the trail of a wild boar! Attitudes to horses vary, as they do in Britain. Many French people are just as passionate about "le cheval" as we Brits can be, and owning a horse can be a great barrier breaker and conversation starter... even if your French is not all it should be! They eat horses in France, don't they? Of course, we all have to deal with the fact that they do eat horses here (I have lived here for three years and still find it difficult to walk past the horse meat section of the supermarket). Although not eaten by everybody, horse meat is still popular in France, particularly with the older people. Sadly, even Gordon Ramsay seems to be endorsing this practice and trying to introduce it to Britain... but that is really another topic. Rest assured, in general, that France can be as horse friendly as Britain. It is different, particularly in the south, but with a little care and pre-planning your horses can enjoy their new lives "en France" just as much as you will! Bon chance! Equine Rescue France - We are an English speaking registered not-for-profit association dedicated to the welfare of horses, ponies and donkeys in France. 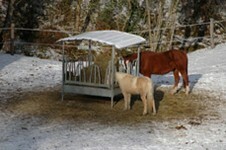 We provide lots of information for people moving over with their horses. 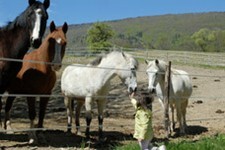 This information includes care of equines in general, care of equines in France, as well as how to report a welfare case. Joanna Simm moved to the Languedoc area of south-west France in October 2004, having found her property through French Property Links. She took with her two horses, three dogs, five cats, three guinea pigs and a rabbit. Is there any link that you know of that could give us the estimated figures of the number of horses per country, or only in France or Germany. Thank you in advance. I'm sorry I cannot be of more help. I'm thinking of moving my horse with me to France and I will be based in Boulogne-Billancourt in south-west Paris. I've found a few sites for livery which quote prices from 150 Euros to 450! What I want to know is whether these prices are per week or per month, as this will make a difference about whether or not I can do it! It seems that nowhere on any site does it specify this. Advice would be very much appreciated, as would more general information about livery in France. Thanks for contacting us. I would suggest you contact the sites you are looking at to see whether they are charging by the week or by the month. From the variation in price you give, I would think they cover both options. I have been in contact with my colleague Joanna who says: "I pay 200 Euros a month to a friend... for a field, two stables and straw, though all other expenses are mine. So I can't imagine 150 Euros is for a month... unless you are incredibly lucky and my friend is doing me over bigstyle! Depends totally on the individual liveries though, you really have to contact direct to be sure. Areas vary too, some horsey areas like Normandy may be cheaper and burnt areas like here in the Languedoc probably more expensive. Provence worst of all I should think as it's hard to find pasture land there. I know, I looked!" Property for sale to be used as livery stables. Would you know what the laws are concerning the acreage needed for each horse in the Tarn area of SW France? I am trying to collect information so any you could give me would help. "It's not an exact science, but I made the mistake of thinking that the same area would be ok here as it was in England. Now the Tarn is a little greener and less hot then here where I am, they get a bit more rain but not a lot... so I would double what you would say in England. Many horses here exist in small paddocks though and are supplemented with hay all year or in the summer especially. I currently have two horses on about a hectare and they are fine, but still need hay all summer after the ground dries up and in the winter when the land gets muddy. The biggest problem I have found for British horses are the flies... there are some horrible flies here and British horses just don't seem as tolerant as French ones... so fly sheets, masks, sprays and shelter are essential. I'm not aware of any laws here though, specifying acreage per horse." I am not sure if you are able to help me, I have picked up your e-mail address from an article about moving animals to France. We are going from France to the UK in August with our pony for a three-week holiday (yes, mad I know). What paperwork do I need going this way and how do I find somewhere to stay overnight with him, preferably in the Reims area (a field and farmhouse B&B is what I am ideally looking for)? It would be fantastic if you could help, but please don't worry if this query is outside your brief. Thanks for contacting us. I have been in contact with my colleague in France who wrote the article, but she says she isn't able to offer much help unfortunately, with where to stay overnight. She says "You really need local knowledge and I am nowhere near Reims, though of course searching on the internet may find you something. But be warned that August is nearly the only time of year when the roads can be bad in France... if it's hot it could be tough on a pony. In general though, I think you can pitch an electric fence and a tent pretty much anywhere... a good idea might be to ask the Mairie of a village you like the look of... but contact them in advance." I wonder if you can help me. My partner and I will be relocating to the Cadarche area of France. My partner has an event horse and he will be coming with us and I am struggling to find good information regards stabling and livery local to this area. I would really appreciate some recommendations and sites to visit. Your help is greatly appreciated. Thanks for contacting us. I'm afraid that both my colleague Joanna in France and I are not familiar with the area you are moving to, so I would suggest you try the "Pages Jaune", France's Yellow Pages directory (http://www.pagesjaunes.fr/) to find stables or livery in this area. Or you could try posting a question on a site such as http://www.equineonline.net/ - using their forum to find out if anyone can recommend anywhere local to you. Could you please assist? I am based just outside of Carcassonne in Conques sur Orbiel and am looking for a blacksmith and a good hay (foin) supplier. Do you have any contacts please? Thanks for contacting us. I have been in touch with my colleague Joanna in France who says the best thing to do would be to ask your vet... or contact local stables. Hi - I saw your article on moving horses from the UK to France. I plan on moving two horses from Ireland to France next year, and I was wondering if you could give me some kind of estimation of the cost of moving the horses, or info. on a good way to do it, and if there's any kind of quarantine in France when moving horses. Any info. you could give me would be very much appreciated! "No quarantine as far as I am aware... and not when I moved mine here. Would only apply if there were a disease outbreak as happened in Spain or Portugal some years ago. I used PARKERS... a firm of UK movers (will certainly cover Ireland) who were superb in every way... lots of overnight stops with stabling, professional grooms, horses arrived in excellent condition and the charges were very reasonable. Their contact details will be in the back of Horse and Hound each month. I paid £2,000, to get two horses from the north-east of England to the south of France... five years ago, so probably more now but I don't think it is too bad still. A friend here brought two from Hungary recently, she went with a cheaper firm to save cash and it ended up costing more. They were not that good, kept putting off the journey etc... she wished she had just gone with Parkers, about whom no-one has heard a bad word ever! (No I don't get commission!)" I hope information is of use. Am looking into moving my horses next year and obviously looking into everything early enough. It's great to know about who you've used and the grazing situation etc and have certainly made notes. I'm going to ask one question and that is do you know what the grass is like in Brittany in the Morbihan area (56) as this is where we are thinking of moving to? Also do your thoroughbreds cope ok with the different climate? I look forward to your reply. Many thanks and keep up the good work on the info. I'm afraid I don't know Brittany. To find people in your proposed area with horses who will know about the grass you could try the FORUM sites such as Total France. Just google. And I really wouldn't worry about the climate in Brittany... not that much different from the south of England! My horses moved from the north-east of England to the south of France... bit of a difference there. Winters are still cold, here and there, summers may be hotter but it isn't the heat but the flies that are a problem here. Might well be the same in Brittany, maybe less so. A fly rug, head mask and a big deep field shelter are the answers. Or bring the horses in during hot days. Please can you tell me in which months the mouche plat appear and disappear, and also what are the hours in the day that the bot fly appears which is when you bring your horses in? You may be interested to know that on discussion with my vet in the UK regarding the mouche plat, he spoke to the company who manufacture Frontline. As these are parasitic flies, after doing a test area on a small area of skin and checking it is ok the next day, ie no sensitivity to it, just as you would do with any new product you would use on your horse, you then can spray or use a natural sponge to apply Frontline on the area where the flies gather. You don't need to get the flies off, you wipe right over them. I repeat the next day all around under the tail and down between their legs, and wherever they go on my individual horses. You only need repeat this once a month and it really works. "Mouche plat (flat flies or crab flies aka) can arrive anytime in summer depending on the weather... but are more prevalent in some areas than others. Here (near Castelnaudary), thank goodness, we don't see them at all, but near my friend's place in Mirepoix they are a nightmare. Butox or similar from Vet often sorts them out, as can goodly doses of Vaseline around the horses bottom... sorry, no time for mincing words...that means they can't get a grip! If you see them, pick them off and hit them with something very hard! The bot fly tends to come only when hot, usually anytime from July through October, rarely in the mornings, anytime after lunch and goes away when the sun drops. I used to bring my horses in around 11am to avoid it, though some horses are more bothered than others by this little pest. It doesn't bite, just buzzes and darts around which can disturb horses badly. This year, I have a great solution, which is a large, deep, dark and airy walk in a barn in the field. The bot fly will follow the horses in but won't stay more than a minute as it likes the sun." I have been reading all of the useful information on your website regarding moving to the different regions of France to set up a farm or property for an equestrian business. This is very early days for us looking into this, so please forgive my naivety. Never the less this is something more for my children than me. What would be helpful to know is what prospects there would be for my son and daughter aged fifteen and twelve respectively, to go into studies at a French college to become involved in Horse Physiotherapy or Riding Instruction, certainly in running an establishment including the care of the animals as well as the business acumin. They are currently doing their GCSE's here in England and my son in particular is about to move from school to college this summer in persuit of his A levels. From there he will be looking to do human physiotherapy at university before in this country he can even consider a course on equine physio. It is a long route for a career, with years of studying ahead! Possibly seven years which seems an extraordinary time when he has been working with horses from an early age. As I read on many websites and from my visits to France (including the Cadre Noir) it does seem that the horse is so much more cherished and certainly seems to be more available as a pursuit when compared to here in the UK. Are the qualifications to study equally more available in France? Are there specific places where a young person can go to achieve recognised certification in differing levels of speicifically horse care? If you do have any ideas on this or any associations/organisations we can contact to find out we would be very grateful of the information. "I can only answer this fairly broadly, as although I have had horses all of my life, I have only ever been a hobbyist, as it were, but I do know that our local Lycee does indeed have several courses at Bac level involving horses/riding. There is also the Lycee Agricole here which has extensive horse facilities, even the ordinary Lycee has a showjumping course set up all summer. So I think it is fair to say qualifications in horsemanship are respected here and certainly should be on offer as part of general education and later as specialist subjects. But I have no idea what area of France you are considering. The Lycees I am speaking of are in Castelnaudary 11400, Aude, Languedoc. The main Lycee is called Jean Durand (04 68 94 53 00), and they should be able to direct you to the right person to speak to, even if it is just a general question about courses available. Incidentally, almost all Lycees take boarders at a very reasonable rates, nothing like in England. But one thing to be aware of in France is that education here goes on for ever, no matter what courses/further education are chosen! So although it may seem a long haul in the UK, it may be similar here. I hope this information will be of some use." I am looking to move to France to run gites and do riding holidays. Do you know what certificates or paper work you would need to do riding holidays / treking? Also I am a keen showjumper and compete at BS events in the UK up to 1.20. I have a horse that has no breeding so can only compete at club level, so what height does club level normally go up to?? "It is highly unlikely with no qualifications a person will be able to teach riding here, other than under the supervision of a French qualified instructor. The French are extremely hot on paper qualifications. I have BHS qualifications and twenty years experience and it has taken eight years to finally gain the right to teach in France. It is not impossible, just very, very difficult. Also, you will need to have an extremely strong command of the French language to even get off the starting post. Sorry it is not more straightforward, it is very different here and it is best you know what you are likely to be facing." Perhaps you could contact some riding holiday companies to see what is required? I've been told that it is illegal to put horses together in a field if they are wearing shoes on both pairs (front and hind) hooves. Is this correct? Is there a rural code that specifies this? Secondly, is there an allocation of land size requirement per horse in France? Legal or rural code? Thanks for contacting us. I have been in touch with my colleague who says she has never heard of this... certainly the yard where she kept horses, the horses there were both shod and unshod. And she also said that she wasn't aware of any laws/codes in France regarding the amount of land that should be allowed per horse. Should anyone reading this be able to help further, please do get in touch. Hi - I have a question about grazing land for my horses. My husband and I are moving with our horses to France. Most likely to the Provence coast around La Cadiere in the Var. I am just a little worried about the grassy field that I imagine my horses to run around and graze on. Since it must get really dry and it is close to the ocean, do you think I would get by with just a huge sprinkler system or is there a whole bigger issue due to the salt in the air and so forth? "Provence can be tough if moving with horses. There is little lush grass and hard to find even ground too. That's why we ended up in Languedoc not Var. But, if you find a place there I would suggest the biggest problem will be flies in summer so shelter is essential. Think reversed seasons - inside with hay in summer, out with a little grass in winter. It is a tough adjustment for UK horses." Hi Jo - I am looking to trial keeping my horse in Languedoc-Rousillion (as near to Uzes as possible). Can you recommend a livery yard in that area, or direct me to a web resource which lists possible yards? Many thanks. "I don't know the Uzes area well enough, but there are various forums and so on worth a go. One is "Hobos in France", then there's "The Languedoc Page" and "The Aude Flyer" - all should come up on a Google search. You should able to find some information from these. I would also really advise you to go to visit the yards once you have found some. Many in France have very small boxes and little or no turnout, which isn't good!" Should anyone reading this be able to help further, please do not hesitate to get in touch. Just about to move myself and beloved horse to Poitiers, France. Cannot find out from anywhere, or anyone, what the legal requirements are or who to contact. Can anyone help? Thanks. I have enjoyed reading your information thank you. I have just moved to live in Villereal south-west France and I am going back to collect my two ponies to bring them across the first week in November. I am trying to find somewhere to stay with both ponies and my mother on the way. Possibly somewhere not too far from Calais, perhaps a couple of hours journey into France. Do you have any information you could provide me with to find somewhere please? Anything else you think may be helpful would be great. I have a companion shetland that I drive and a section d cob cross dutch warmblood that I have bred myself to use as a riding horse (I have got to the point where I want something safe that I bring on myself, the days of riding anything have passed... he is only a yearling so I have many years to bring him on and enjoy him, he should make about 16hds. "Unfortunately I don't have any personal knowledge of the north of France, but I know carriers (the professional ones) use livery stables for overnight stops all through France so they must exist. So the only thing I can think of is that you pick a large place where you will want to stop and Google madly (probably in French is necessary) for stables near to where you choose. I have no idea really where you might want to stop, a couple of hours into France is quite vague and you aren't going to be driving very fast with horses. The livery yards are usually called Pension des chevaux, or similar. Also, Villareal is a long way, so it will be quite a journey and you might want more than one stop. You could try asking professional carriers too (see the back pages of "Horse and Hound" for ads), and see if they are prepared to suggest possible livery yards, or try forums. Hobos in France is as helpful and friendly as any." I live in France and I would like to rescue a horse. It is near on impossible to rescue an English horse to move out of the country and I wondered if there was anywhere near me (Sarthe 72) that you know of that rescues horses/ponies please. "There are various equine rescues in France, one in Dordogne called Phoenix is very good. I would advise posting on forums like Hobos in France for more local information." You could perhaps also contact some vets near you, who may know of rescue centres, and if you haven't already, you could also try the link at the bottom of our article for Equine Rescue France. They may be able to suggest somewhere closer to you. Myself and my partner have a house in the south of France which is situated within 10 acres of land, up a hill in a very remote rural area. Currently the land is not being used for anything, so as we are both animal lovers we have decided to look into building kennels and stables. The stables will be for livery only, schooling / exercise is to be the responsibility of the owner, but whether it be DIY or full-time livery each horse will have their own stable and their own 1 acre grazing paddock plus enough hay to ensure their diets are met if it gets too dry or too wet / muddy. I wanted to ask you if you know of any qualification/s which will be needed for us to do this? Or if you know of any specific regulations we need to meet? Any guidance would be greatly appreciated. Thanks for contacting us. I have been trying to contact my colleague Joanna about this, and am currently awaiting a reply, but in the meantime perhaps you could contact and visit some existing liveries/stables in your area, and see what is required. You could also check with your Mairie, equine vets in your area, the French equivalent of DEFRA (www.agriculture.gouv.fr), and look and post on forums such as Hobos in France. Hi - I have made the sad decision to have one of my horses put to sleep. I am trying to find someone to take the body to an equarrissage, but I can't find any information and my vet is not being helpful. My French is not good so rang the only other English speaking equine vet and he is on holiday. The Yellow Pages doesn't list anyone. Can anyone help? I am in 65230 dept 65. "It seems crazy your vet can't help. It's a legal requirement in France and there is usually just one organisation per area that does it. Is there a riding school or farrier nearby who would know? Or even the Mairie? If you're really stuck, perhaps you could you try non-English speaking vets etc by using google translate. They may well understand non-perfect French, what with so many Brits in France! My experience was that vets arranged the disposal and you just had to wait until the equarriseur could come, having left the body covered by a tarp. You then had to pin the cheque to the tarp just before they came. Not a nice system." She has tried to contact another colleague in France for further help, so I will get back to you if we hear anything. "Yes I know about this as I had to have my soldier put to sleep three years ago. The vet didn't organise it but I think they did give me a number to ring and they were fairly rapid and understanding but expensive, nearly 600 Euros." I think I am nearly there, 48 hours seems to be the response time. Price I have been quoted is 290 Euros inc taxes but I found the latest tarriff and for some reason prices vary from about 130 Euros plus tax up to 600 odd Euros depending on the department you are in. I am thinking of going back to the UK with my horse and can't seem to find much information on the new Export Health papers. For example how long do they take to sort out, how long are they in date for and how much do they cost? I understand I have to get my local vet to look over my horse and then I have to take some papers to my local Government Office, I'm not even certain that's correct. Any information would be great. My colleague Joanna says she didn't have to do anything other than have her passport when she brought her horses back. So she suggests you ask your equine vet in France about the current rules, better still ask two to be sure they agree!Sorry we can't be of more help. Should anyone be able to offer any further advice, please do get in touch. We moved our two horses back to England from France two years ago. One horse I bought in France, the other was bought in England and then she moved to France with us. I used a UK horse transport company and they took care of everything. I believe that only their passports were needed as I did not have to do anything else beforehand. The company I used specialises in European travel. Both horses were up to date on their vaccinations, but I don't think this was even asked about! Hi - we would like to purchase in Brittany within the next three years and I would like to bring two horses with me. I have read the French government info about importing horses however would like to talk with someone who has taken horses to the North of France from Australia. Can you help? Hi - I have just been reading your article about horses in France. I have just bought one horse and two ponies and pay friendly neighbours for their grazing, we built our own field shelter (comme une Maison de Maitre so the locals say) although I seem to be constantly worrying about them and wonder whether or not it is worth me putting them in livery. On verra. Many thanks for creating such an interesting and enjoyable site! Hi again. I wrote to you last July having bought two ponies and a horse, I did eventually decide to move them to livery nearby. Now my worries are over. They are well cared for and I can go on holiday whenever I like! One pony has been taken on as an "au pair", (she is used for the children to learn to ride) and therefore costs me nothing, only vets bills if need be. The livery is http://www.pontdecalmel.com based between La Caunette and St Pons. Recommended to anyone who has a horse nearby or who fancies a wonderful holiday in France with horses. And to top it all the owners are really friendly! So my poor self-built stable now houses chickens - anyone out there want any free range eggs?? I read your article and just wanted to clear things up about rates, as prices vary mainly on location. For example Paris and surroundings will charge around 600 to 700 Euros per month for a box plus 10 Euros per day for working the horse. I live in the far away department of La Creuse and I have a livery yard for horses and I only charge 150 Euros per month including vaccines, worming and farrier for hoof trimming as well as free use of the outdoor arena. Being professional, I'm fully insured for any liability. When coming to France you should be aware of non-professional individuals who offer cheap rates but who usually work illegally. Another important thing is that as of 24/1/2011 all horse keepers (whether you are the owner or not) will have to be registered with the authorities (veterinary services, agricultural services, etc) and they will receive a national identification number. You don't seem to have mentioned that all horses coming into France need to be registered in France. Before leaving the UK you should have had your horse checked by a vet within 48 hours of leaving the UK. We stayed at a DEFRA approved riding school in Folkestone and then started off early to get to the ferry. DEFRA had neglected to tell me I needed an export licence for my horse. This was done at the Port Of Dover by a very efficient young lady. I also had two dogs with me, but their papers were in order. Upon arriving in France, you need to contact an approved vet who will do the papers and send them off to Haras Nationaux for you. I brought a Welsh Cob with me and we stopped a few times during the journey to Creuse for him to walk round and have a nibble of grass. Make sure you carry plenty of water with you. Once your horse is registered in France, vaccinations are the same as UK. Our vets are first class and the practice we use does large animals, and companion animals like cats and dogs. The service and the price cannot be beaten!! I hope this helps.